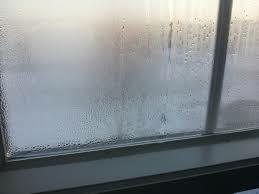 Condensation is the accumulation of liquid water on relatively cold surfaces. Almost all air contains water vapor, the gas phase of water composed of tiny water droplets. The molecules in warm air are far apart from one another and allow the containment of a relatively large quantity of water vapor. As air cools, its molecules get closer together and squeeze the tiny vapor droplets closer together, as well. A critical temperature, known as the dew point, exists where these water droplets will be forced so close together that they merge into visible liquid in a process called condensation. Double-pane windows have a layer of gas (usually argon or air) trapped between two panes of glass that acts as insulation to reduce heat loss through the window. Other types of gas used in this space have various effects on heat gain or loss through the window. Some windows also have a thin film installed between panes that separates the space between the panes into two spaces, further reducing heat loss and heat gain through the window. If multiple-pane windows appear misty or foggy, it means that the seal protecting the window assembly has failed. Silica gel has an immense surface area, approximately 7,200 square feet per gram, which allows it to absorb large amounts of water vapor. As the sealant protecting this space fails over time, increasing amounts of moisture-containing air will enter the space between the panes, and the silica pellets will eventually become saturated and will no longer be able to prevent condensation from forming. A double-paned window that appears foggy or that has visible condensation has failed and needs to be repaired or replaced. Condensation is not always visible. If the failure is recent, a failed window may not be obvious, since condensation doesn’t usually form until the window is heated by direct sunlight. Windows in the shade may show no evidence of failure, so inspectors should disclaim responsibility for discovering failed double-paned windows. Looking for a Connecticut home inspector? Contact Allied Home Inspections LLC - "Inspected Once, Inspected Right!"